This week UK inflation as measured by the Consumer Price Index (CPI) surpassed the Bank of England’s (BOE) 2% target. Prices rose by 2.3% in the year to February 2017. In monetary terms, a basket of goods costing £100 last year now costs £102.30. Even though prices are rising, the BOE state that it will allow inflation to float above the 2% mark as policy is expected to remain loose to provide support to the economy. The Bank expects CPI to push close to 3% by the end of the year, with higher energy costs knocking onto higher transportation costs. Furthermore, the depreciation in sterling since Brexit, has forced the costs of imports higher contributing to the higher inflation. Higher inflation continues to erode wealth, especially for cash investments. It is vital for investors to have an awareness of the negative effects of inflation relative to the return they receive on cash deposits. Morningstar recently stated that 792 of the 793 savings accounts currently on the market, offered a rate of interest below the 2.3% inflation level. In response to the challenges confronting Europe since the financial crisis in 2007-09, the European Central Bank (ECB) has used unconventional monetary policy strategies. This includes quantitative easing (QE), to stimulate an economic recovery and pull away from the threat of deflation. The bank embarked on QE (an aggressive bond-buying programme) in 2015 and subsequently took its policy rates to negative levels. 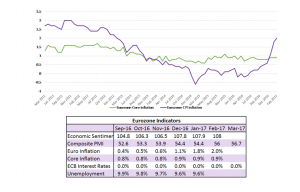 After years of monetary stimulus to kick-start the economy, the ECB is now facing calls to tighten policy which would include raising interest rates, in response to an economic recovery seemingly well on track and inflation rising again on the back of rebounding energy costs. Economic Sentiment Indicator – that aims to characterise general social economic conditions has been gradually pushing higher toward pre-financial crisis levels. The Purchasing Managers Index (PMI) measures output in manufacturing, construction and services. 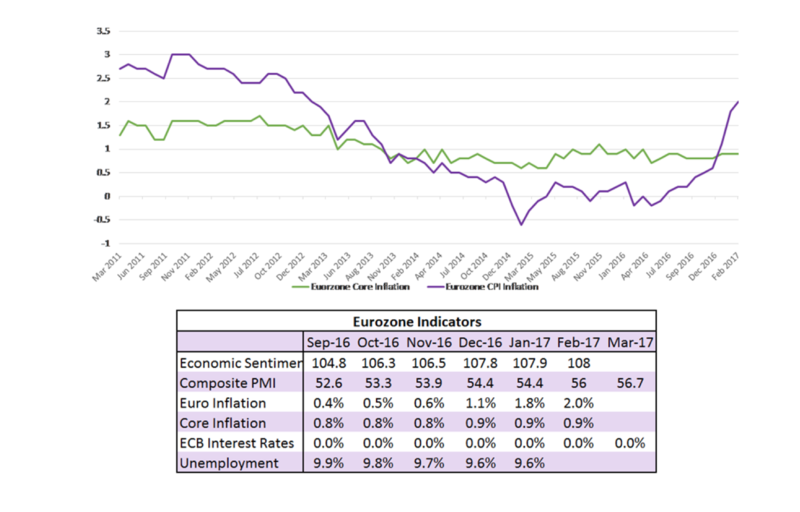 Recent figures paint a bright picture of a Eurozone starting to fire on all cylinders. Inflation has pushed up to 2% for the first time in four years underscoring a sharp rise in prices driven by higher energy costs. Interest Rates – the main rate remains at 0%. This has been supportive for keeping cost of capital low but at the expense of those holding cash deposits. Unemployment – remains stable in January, and its lowest level since May 2009. The French election process is well underway and is being scrutinised closely by market participants who are extremely wary of another so called populist backlash. With the first round of voting coming up soon on 23rd April 2017 there is no clear favourite. It is likely the election will go into a second ballot between the two main candidates, extending the process until 7th of May. The polls so far have been volatile, Francois Fillon, the centre-right Republican leader, previously in the lead is now lagging, due to a corruption scandal involving a diversion of public funds to his British wife. Marine Le Pen has also lost ground after the Geert Wilders came second in last week’s Dutch election. On Monday, Le Pen announced a pledge to stop all immigration, ‘illegal or legal’ and leave the European Union, stating the results for UK are ‘fantastic’. Fillon has also been pushing to recover the lost ground, by dismissing Le Pen’s plans. 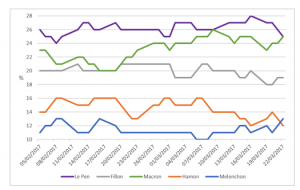 Below we display the latest poll produced by OpinionWay, with Le Pen and Emmamuel Macron (leader of En Marche) expected to compete in the next round until 7th of May. 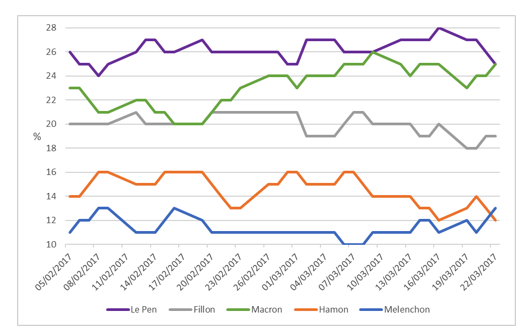 Although Le Pen is slated to make it into the second round she is not expected to win – but who knows what could happen! While the political outlook remains uncertain, the region remains attractive to our fund managers who are looking to capitalise on Europe’s economic revival, corporate earnings growth and a resurgent banking sector.